It’s been something of an ’80s nostalgia-fest here of late hasn’t it. Sorry about that, but I guess these songs were from my formative years musically and so have a special resonance for me. And look, here comes another one pounding down the tracks. And before anybody starts, yes, I do know that this is a cover of the great Smokey Robinson song. But as with my earlier post of Dear Prudence, it’s the early 80s cover version that is my frame of reference for this song. And whilst I do like the Smokey Robinson original, the energy and drive of The Beat’s version is what makes it for me. The Beat (or English Beat, as they got named in the US) came to prominence as part of the Two-Tone movement in the late 1970s. Two-Tone took sounds that originated in Jamaica (rocksteady, ska, reggae), mixed it with the energy and attitude of punk and new wave, and sprinkled it liberally with a political conscience, creating a truly grass-roots, cross-cultural movement. Bands like The Specials, Madness, and Selector were all part of the scene, and The Beat were there right from the beginning. 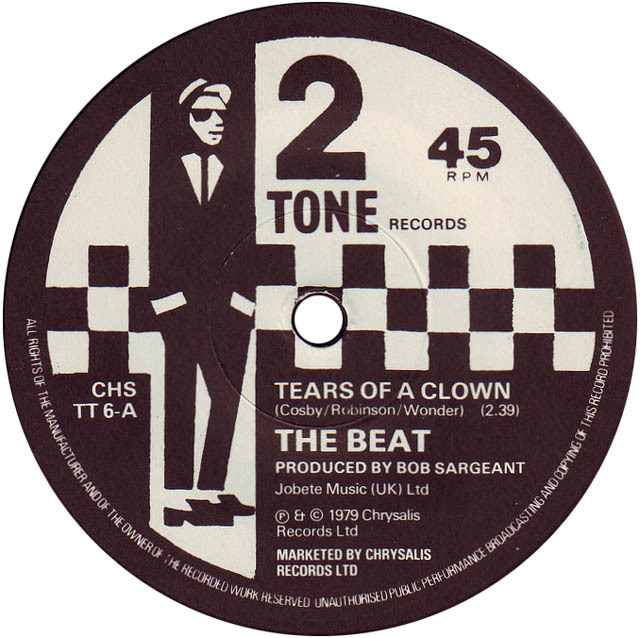 Tears of a Clown was their début (and sole Two-Tone) single, reached the UK top 10 in early 1980. The Beat split in 1983 after just three albums. However the band have reformed, although now exist in two versions – one, mainly based in the US, fronted by singer and songwriter Dave Wakling, and another, based in the UK, fronted by vocalist Ranking Roger. I saw the UK version a few years ago here in Southampton and they were storming! Definitely worth checking out. The songsheet aligns to The Beat’s version, and is relatively straightforward. In fact, other than the chorus it’s essentially just a repetition throughout of the A/D/G/D chords. The chorus chucks in a few curveballs (E, C#, F#m), but if you play E as the barred-D shape on the 4th fret, and C# as the Bb shape on the 4th fret as well, it works OK. I’ve included the little dinky riff as well, if you want to play around with that. And if you want to get something of The Beat’s feel to this, then the rhythm is key. Listen to the original to get the feel, but it’s something like [A] d d-u [D] d d-u [G] d-u-d [D] u u-d-u, repeated. Play with energy, and enjoy! Categories: Reggae/Ska | Tags: 1979, 1980s, Ska, Smokey Robinson, The Beat, Two-Tone, ukulele | Permalink.